Spatial Computing – Going where no Finance Professional has gone before! Written for and republished with kind permission from CFO.co.uk. The way we interact with computers is changing forever as a blend of technologies allow us to cut cables and increase immersion. The spatial era is an opportunity and a risk. ‘Spatial Computing’ might seem like a new idea – one of the endless revolutions in technology. Another way to see it is as a continuation of the development in ways we interact with computers - and by virtue of that, also each other. The early 80s gave us typing (MS-DOS). By 1984, Apple had introduced the GUI – mice and windows - into the original Macintosh. 2007 saw haptic (touch) interfaces mainstreamed through the iPhone. And by 2016, the first ‘spatial’ computing interfaces began to appear on the horizon. If you got an Amazon Echo unit this Christmas, those Alexa commands are a spatial interaction. But spatial interfaces are wider-ranging than that. You may remember the Pokémon Go phenomenon of 2016. Literally millions of people around the world used their iPhones to locate (via GPS), chase, battle and train the computer-generated character, Pokémon. While good fun for the most part, it caused many bizarre street scenes of folks chasing ‘rare’ digital characters; and one Russian video blogger even received a 3.5 year suspended sentence for playing the game in a church – on charges of blasphemy. The significance of Pokémon Go is that it was the first time that AR (Augmented Reality), the technology that superimposes a computer generated image on a user’s view of the real world, had entered mainstream consciousness. Just as Amazon’s Alexa has consumerised the voice context, Pokémon Go normalized AR for millions. And just around the corner is Virtual Reality, or VR. Those of you who were around in 1990s might remember ‘The Lawnmower Man’, a film which depicted a simple-minded gardener who developed superhuman intelligence as a result of being immersed in Virtual Reality worlds. In VR worlds, we operate in entirely computer-generated environments and typically interact with them via an embedded screen headset and a set of handheld controllers. All the major tech companies are investing in VR and the hardware to support it (check out Oculus Rift, HTC’s Vive and the secretive Magic Leap). VR presents even richer opportunities for spatial interactions. What has this got to do with finance professionals? Firstly, the lifeblood of finance is data. But data is no good if it’s not translated into insight. All too often, numbers are presented in spreadsheets, PowerPoint presentations and, increasingly, through onscreen data visualisations. But imagine being able to actively explore three-dimensional representations of how money moves through the business. Or the ability to execute Excel-style what-if analyses visually – and actively work your way through multiple scenarios? Imagine being able to actively explore three-dimensional representations of how money moves through the business. Or the ability to execute Excel-style what-if analyses visually – and actively work your way through multiple scenarios? We should also talk about payments – a key consumer application of these new interfaces. Nowadays, consumers and businesses alike are entirely familiar with buying online using online payment services such as PayPal or by entering their credit card details. As AR and VR grow, so will commerce inside these virtual environments. Payment provider Worldpay is already aiming to mitigate security concerns over payments made inside virtual worlds. As your marketing and sales functions begin to move towards virtual environments to increase customer engagement, you will want to feel confident payments are taken securely. We’re still a little way off these technologies maturing. High-end VR is still a fairly niche consumer market (at least, it is in the West: Korea already has a booming consumer VR market and is a good place to look for future trends). This is in part, because headsets and hardware are relatively expensive – a decent setup will relieve you of £2000. Also, the range of applications is still limited. 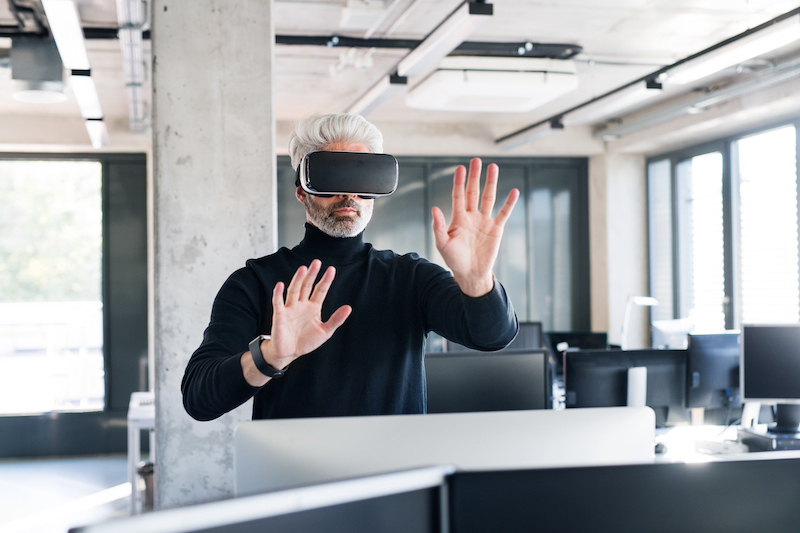 Current forecasts from Gartner Research suggest we’re 5-10 years from mainstream VR applications, and whilst businesses are experimenting, they are hesitant to commit. That said, just as with Alexa and Pokémon, we can expect sudden leaps forward as specific consumer applications popularize the technologies. My recommendation to CFOs is to get ready to proactively manage the associated risks and opportunities of these tools, particularly in relation to data security, payments and compliance with different regulatory regimes. Over and above that, why not get a head start and have a bit of fun by taking your team to one of the growing number of VR arcades popping up around the UK. They’re immersive and great fun!